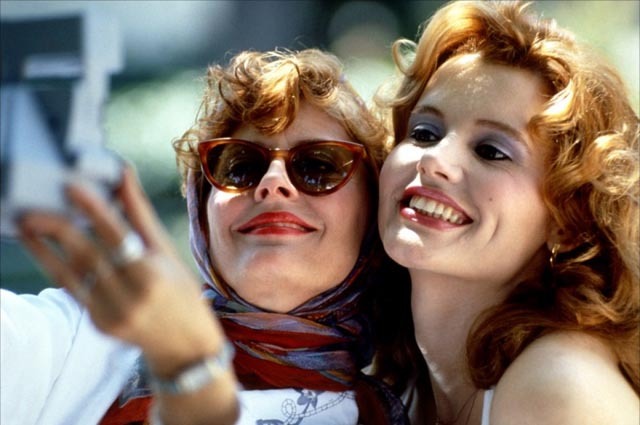 Susan Sarandon (l.) and Geena Davis smile before hitting the road in Thelma & Louise. After two decades, Thelma & Louise starring Susan Sarandon (The Greatest) and Geena Davis (The Long Kiss Goodnight) retains its rank as one of the all-time best chick flicks. Even more, its terrific performances, clever screenplay, lush cinematography and controversial climax have elevated it into the upper echelon of contemporary buddy films. Wildly entertaining from the opening shot of that chrome blue vintage Thunderbird convertible driving into a mountainous desertscape, Thelma & Louise struck a nerve with audiences, and might even be credited with empowering a generation of hitherto repressed, persecuted women (not to mention launching the career of a young actor named Brad Pitt). The film’s Blu-ray debut looks absolutely terrific. Director Ridley Scott’s (Robin Hood) shot selection takes full advantage of the beauty of the American Southwest. Each perfectly framed image is drenched with color, and there’s hardly any grain visible even in the nighttime driving scenes. The scenery is an integral part of the story, and it fittingly jumps off the screen here. For a movie set mostly in moving vehicles, the DTS HD track pops with squealing tires and thrown-up gravel. Gun shots (and there are more than I’d remembered) are piercing, and the explosion of the oil tanker is sufficiently loud and jarring. As an anniversary edition, the single disc is well loaded with special features, delivering all the material released on previous DVD incarnations, including two commentary tracks (Scott on one, Sarandon, Davis and writer/producer Callie Khouri on the other), more than 30 minutes of deleted and extended scenes, and a separate, extended ending available with director commentary. Having never before seen the excised conclusion, it’s clear the theatrical version is far more satisfying. Also of note is Charles de Lauzirika’s 2002 documentary, “Thelma and Louise: The Last Journey,” which includes interviews with just about the entire cast and crew, even Pitt. Although there’s no new content here, it’s a good compilation of everything that has come before, and the movie itself has never looked or sounded better.